The state is planning on closing Green's high school. They've sent in experts to facilitate the closure. Lois is not going to go down without a fight! The residents of Green need a school and Lois is determined to do all in her power to save theirs. Everyone rally's around saving Green's schools. Chris has pressure at work from the new person sent in to transition the school for closure. Lois, on top of running the newspaper, also is in the midst of remodeling she and Chris's new home. 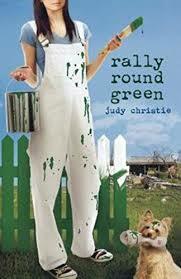 I really enjoyed Rally Round Green. I liked the message of forgiveness and restoration. I liked that even though Lois was wronged in the past by certain people she was able to forgive them and give them a second chance. I love how the whole town comes together to help each other and to help save their school. I've really enjoyed the Green series and look forward to the next one.